For or with? Contract or relationship? In tonight’s brief passage from the Gospel of St John, we heard the parable of the grain of wheat. Christ drew this parable about resurrection on the Kingdom of God from the everyday circumstances of life; it was quite easy for his rural audience to understand the principle of “resurrection produced by dead seeds sown into the earth: the image of the grain of wheat dying in the earth in order to grow and bear a harvest can be seen also as a metaphor of Jesus’ own death, burial in the tomb and Resurrection. Using the example of a wheat seed Jesus tells the disciples that he must die. A wheat seed by itself is just one seed. However, this same seed planted in the ground dies to itself and becomes something much greater. Jesus says the time has come. His time to be glorified is approaching. He will die and through his death there will come an abundance of fruit. In the Gospel there is already evidence of the possible fruit. Who has heard this parable of the wheat seed? There are the disciples. There are some leaders of the Hebrew people. Also, among them there are some Greeks. They have come to see and speak to Jesus. People are coming to see him. Not just the Jewish people, but also the Gentiles. Jesus will die not for the few, but for the many. Jesus will die for the generation to whom he speaks and Jesus will die for the generations to come. Jesus dies for you and Jesus dies for me. But we hear a lot of “for”. During this last week we have been spending time with Christ – so what of the “with”? In her long-ago fevered haze, Julian received a series of visions of Jesus, which she wrote down in a book entitled Sixteen Revelations of Divine Love. Recounting the vision, she ruminated on Jesus’ mother Mary’s suffering, the one who suffered more than any other in his death; then expanding the circle to include “all His disciples and all His true lovers suffer pain” at this death. In this community of pain, forged by the suffering of Jesus, Julian articulated one of her great theological insights: “Here saw I a great ONEING betwixt Christ and us: for when He was in pain, we were in pain.” To Julian, the Cross was about ONEING—the complete unity of God with us and us with God; and not only us as humans, but as she relates from the vision, the ONEING of “all creatures that suffer pain, suffer with Him…and the firmament, the earth, failed in sorrow” and the planets, all the elements, and even the stars despaired at Christ’s dying. The cosmic circle of grief, emanating from Jesus’ Passion, reveals that Jesus not only suffered for us; but he suffered with us—his death occurred for the sake of “Kinship and Love” with all this was, is, and will be. Did Our Lord suffer for us or with us? On many a Good Friday, I have sat in a darkened church, listening to readings and music, all focused on the first preposition of the Passion’s equation: Jesus suffered for us, for sinners, for the world, for me. But only rarely have I heard spiritual reflection on the second preposition: Jesus suffered with us, with sinners, with the world, with me. Some of us here are writers. They choose prepositions carefully. There is a huge difference between for and with. For is a preposition of distance, a word that indicates exchange or favour, it implies function or purpose. I do something for you; you do something for me. Notice: someone does something on behalf of or in another’s place. For is a contract. Jesus suffered for us—means that Jesus did something on our behalf; he acted on behalf of a purpose, in place of someone else. “For” always separates the actor and recipient, distancing a sacrificial Jesus from those for whom he died. 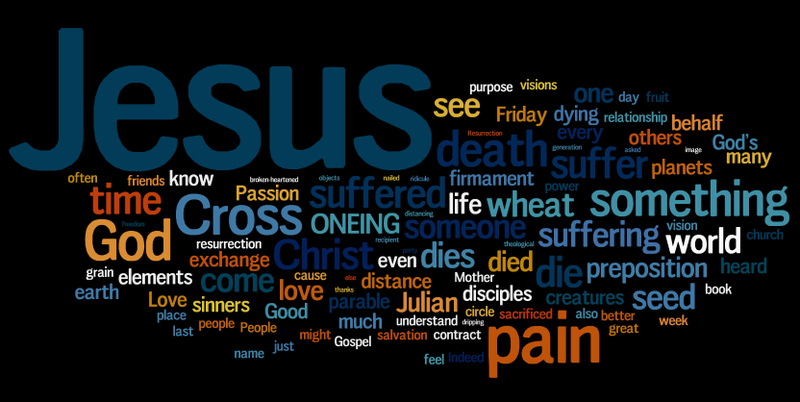 At the Cross, Jesus is the subject; we are objects. For or with? Contract or relationship? Exchange or participation? Quid pro quo or friendship? If we are honest, with is a hard preposition in the world of today. Are you only with those who share your party or cause. We judge others on what they can do for us. Indeed, we are for many things. But we are sceptical of with—indeed; much of what we do in the world makes us ridicule, doubt, and even fear with. It is often safer to remain at a distance, to stay away from with. When we come to Christ, we see the for. We understand the exchange, that God died for me, so I get baptized or confirmed or serve the church. Jesus sacrificed his life so that I might exchange Hell for Heaven. People sacrifice and die for something nearly every day, and it is particularly sobering–as in the case of soldiers—when someone sacrifices or dies for my freedom or safety. Indeed, thinking that Jesus died for salvation may give pause, cause us to raise a prayer of thanks, feel sadness or relief; but ultimately, the idea that someone dies for something is theologically and spiritually uncomplicated. But with is complicated, even frightening. Good Friday plunges us into with. Have you sacrificed with others? Have you walked the way of death with someone? Felt the power of the suffering love? Do you know, in every fibre of your being, the ONEING of God in Julian’s visions? Do you feel Jesus dying with his Mother, his friends, with us, with all creatures, with the firmament, with the planets and the elements? Can you embrace the truth that, at Calvary, Jesus’ Mother, friends, US, all creatures, the firmament, the planets and all elements died there with him, too? The Cross isn’t a contract between God and sinners; the Cross is God’s definitive expression of kinship and love—that everything, everywhere, through all time, is connected in and through pain and suffering. We are with Jesus on the Cross, not at a distance from it, standing by, watching safely from afar; those are our hands and feet nailed, our blood dripping, our voices crying out “We thirst.” And Jesus on the Cross, naked and mocked, is with us all on every broken-heartened, betrayal-laden, blood-soaked day of human history. That is God’s Passion; that is Jesus’ Cross. And, in the tortured Christ, we find the hope to endure, a love for others and creation, the power to enact God’s dream of love and justice for the whole world. We are with God. God is with us. We are often asked if we have time in our lives for Christ. As believers we do. But what is much better in terms of our relationship with him is that we do, as we have done during this last week, spend time with Him. Posted on 6 July, 2013, in Belfast Pride 2013 and tagged Christ, Christianity, Cross, God, Jesus, Mary, Passion. Bookmark the permalink. Leave a comment.